For a shaded spot, here’s a plant that pulls out all the stops. 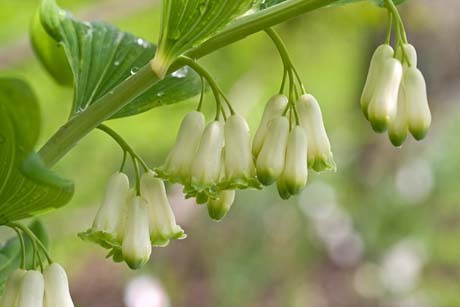 Solomon’s seal (Polygonatum x hybridum) is a woodland dweller whose sublime green-tipped bells march four by four along graceful, arching stems. The plant peaks at around 1.2m high (a shorter version is Polygonatum multiflorum, which grows 60-90cm high), forming an attractive clump of rich green leaves. 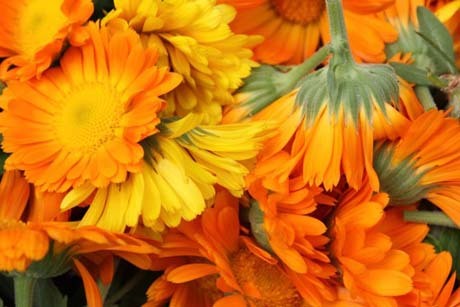 Bloom time is late spring to early summer, and the tall stems can be picked for the vase. Pick when most of the flowers are open. Solomon’s seal is a hardy, herbaceous perennial, dying back in winter, and reappearing around October in the Southern hemisphere. It does best in cool, dappled shade in rich soil with good moisture. Top-dress each year with compost or aged manure then leave it to its own devices; it doesn’t deal too well with disturbances. 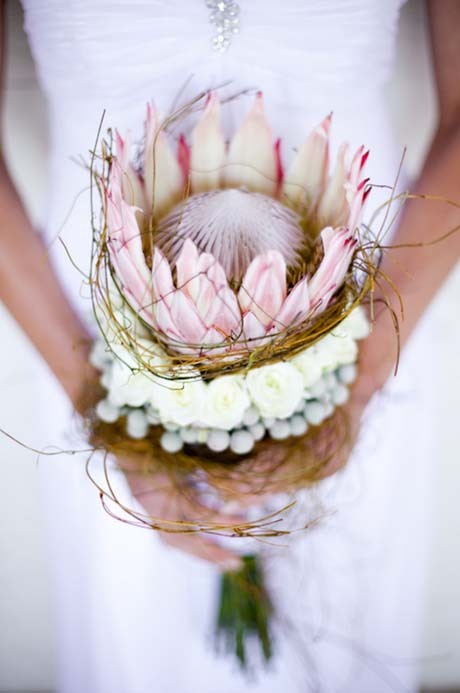 Head down to your local garden centre and you’ll see a range of proteas in store now. Many of these large beauties bloom in winter, so it’s a good time to pick one up. They’re fussy plants – they like full sun and excellent drainage. Don’t bother if your soil is anything but free-draining. Plants won’t survive long if their feet are sodden. 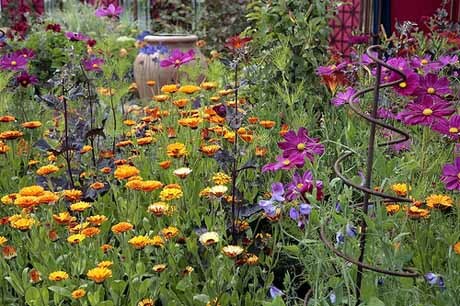 Slopes, raised beds or growing on mounds is ideal. Plant in an open position where they get plenty of air, or wind. A windy spot at least allows for good air circulation which in turn keeps humidity levels down and diseases away. 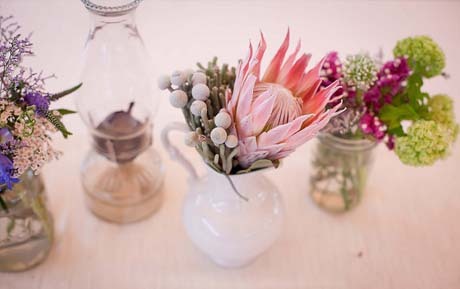 Proteas much prefer poor acidic soils than fertile soils. They’ll tolerate sandy to clay soils, so long as drainage is good. Photo credits, from top to bottom: Southbound Bride; The Pretty Blog; Meredith Perdue; 100 Layer Cake. My dahlia patch has gone berserk. After what seems like weeks of rain, the sun has finally put in an appearance, and so too have my dahlias. Previously the odd bloom was seen poking its head out amongst the sweet peas and achilleas, but now they’re running riot. 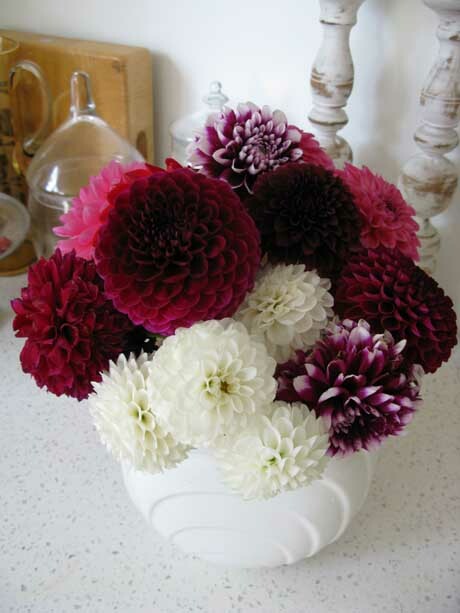 Seen here are a mix of pompom and cactus dahlias. 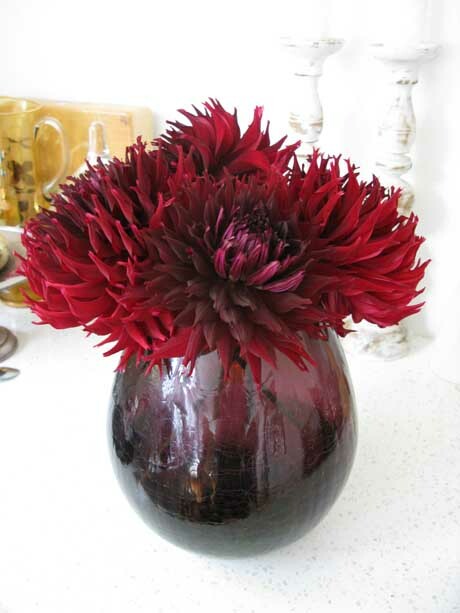 The red cactus dahlias are a mighty 22-25cm in diameter! 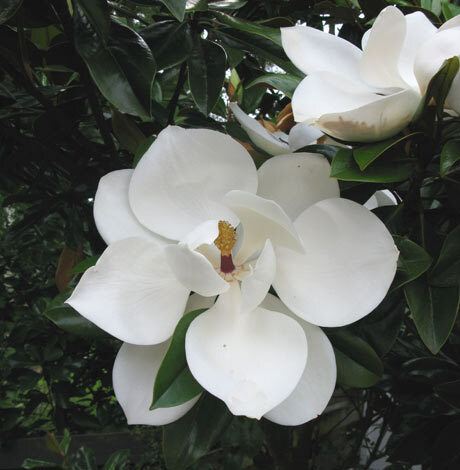 My evergreen magnolias (Magnolia grandiflora ‘Ferruginea’) have been amazing this year. It’s taken a while for them to get going, but this year they’re blooming their socks off. I have three in all, planted side by side, like a pleached hedge. I’m growing them for the leaves, as they’re superb cut foliage, with their polished green tops and felted bronze bottoms. But the dinner plate-size blooms are a definite bonus. 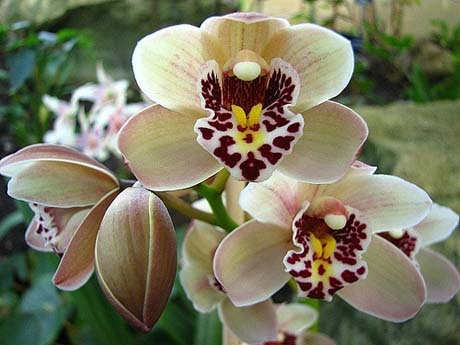 The only thing is once they’re fully open, they only last a day or so before the petals begin to brown and fall off. But the buds take a while to open – and this year there are plenty of them. The flowers began appearing in early December and will continue over the summer months. The flowers are beautifully scented too. As you wander past you can smell the sweet lemony scent on the air. Yet another bonus is that the flowers draw in the bees. Which has to be good for the garden. 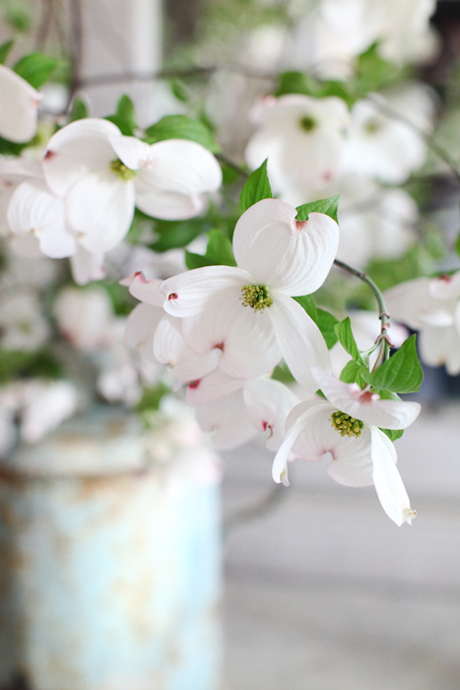 Flowering dogwood (cornus) and trilliums aren’t your typical cut flowers but they do look great in the vase if you can get them to last. Trilliums in particular have short stems that easily wilt after picking. 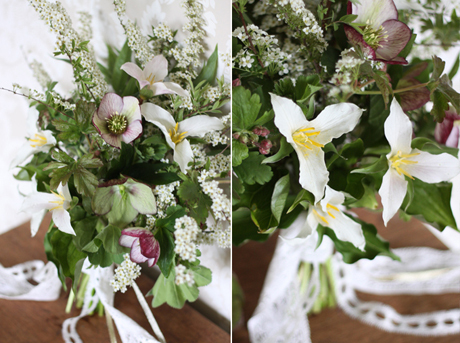 McKenzie Powell managed to keep them looking fab in this lovely bouquet (middle photo), with its handful of spring blooms, including burgundy-blushed hellebores and thryptomene. Trilliums are woodland plants that sport an anatomy of threes: three leaves, three sepals and three petals. They even come in three colours (or various shades of them): white, purple or deep red. Dogwood (top photo, from Dreamy Whites) have white, pink, soft red or yellow blooms, and with autumn comes a brilliant show of reddish-purple foliage. They’re deciduous plants and, like trilliums, are frost hardy. 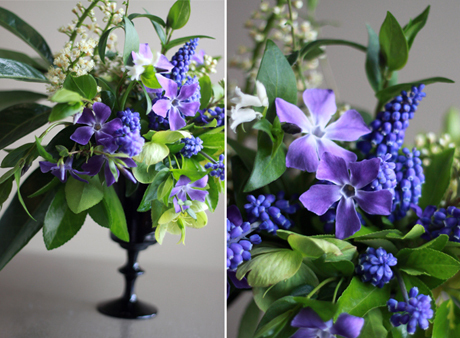 Grape hyacinths and blue periwinkle (vinca) are also spring-flowering (bottom photo, from McKenzie), and don’t they look divine in the vase too, particularly against the lovely deep green foliage. 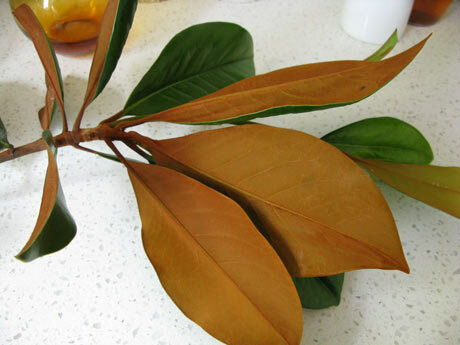 Both these plants grow in sun or part shade, and both are low-growing and spreading. There are some benefits to the cooler weather. 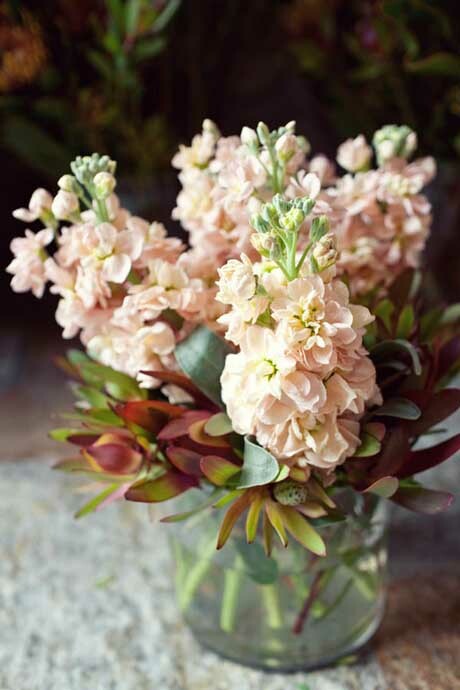 You can grow cool-season plants such as this stunner – stock (matthiola). Colours range from soft pastels to deep cerise and purples, and they also have a to-die-for, musk-like scent similar to Yves Saint Laurent’s Opium perfume. 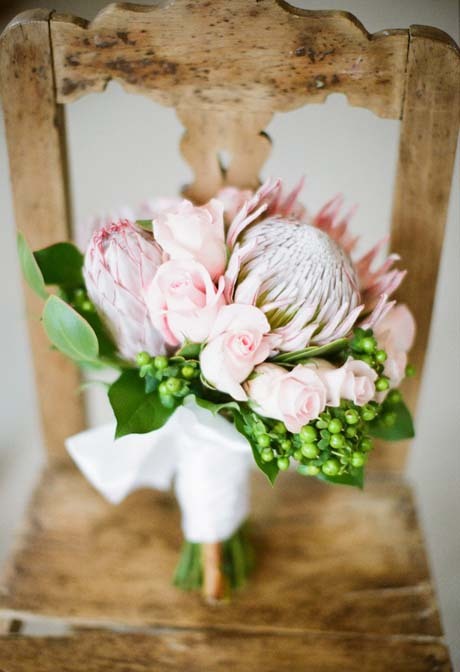 This pretty posy featured at a Malibu wedding, which in turn featured on Style Me Pretty. It’s seen here with a skirt of leucadendrons, which also provide great winter colour. Pop down to your local garden centre and get some stock seedlings for planting now. Wow! This looks truly amazing. 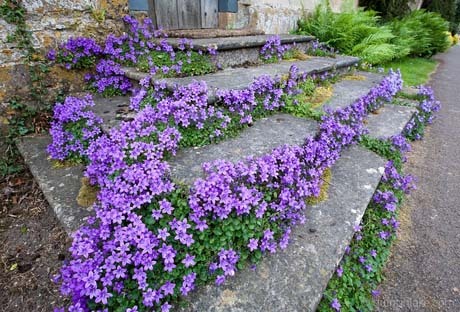 Creeping purple campanula covering what used to be dowdy concrete steps. I bought a couple of ground covering campanulas recently to do just that – Campanula muralis and Campanula ‘EK Toogood’. 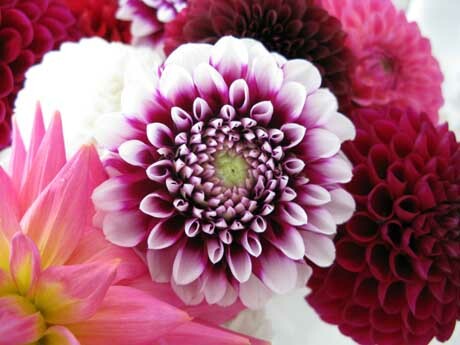 Both have purple-blue flowers in spring and summer, and both grow in sun or shade. These are hardy plants and perfect for covering bare spots quickly, but they grow equally well in containers. This photo is taken in Stanton, Gloucestershire. You can buy them in garden stores now, and if you planted yours early enough, you could be picking them from your garden too. Ranunculi are spring blooms but they often appear in winter, like their seasonal friends, anemones. 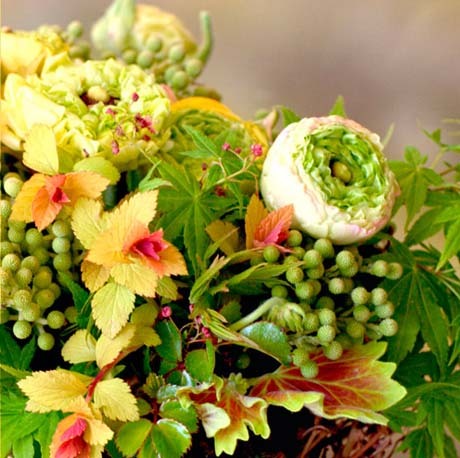 The top bouquet features ranunculus (top and top right of photo) alongside colourful foliage, providing a mellow yellow glow to your winter days. The second design has nothing to do with ranunculus, but I liked it anyway. 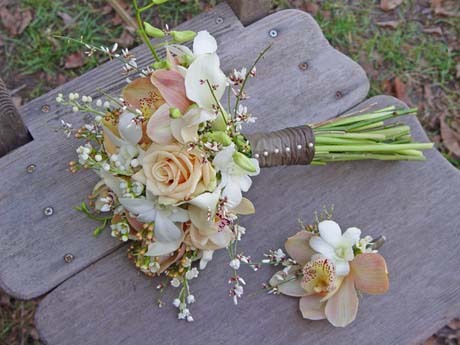 It features the stunning chocolate vine, akebia. 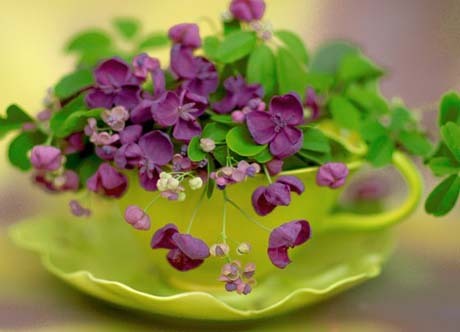 Unfortunately akebia is a banned plant in New Zealand, given its runaway tendencies, but you can create a similar picture using flowers such as pansies, violets, primulas, clematis or hardenbergia. 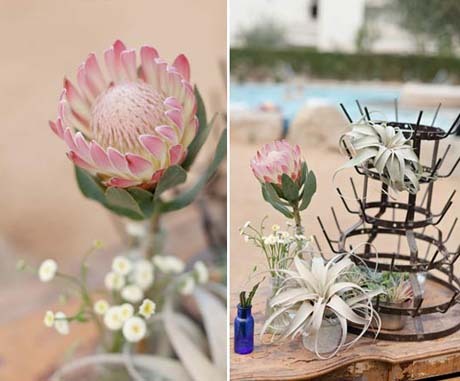 These two divine floral displays are from the amazing girls at Florali.